Vanna K was recently featured in the highly-coveted Bride Magazine (out on newstands NOW). As the #1 source for newly engaged brides, Bride Magazine helps brides define and plan their special wedding day including featuring bridal jewelry. 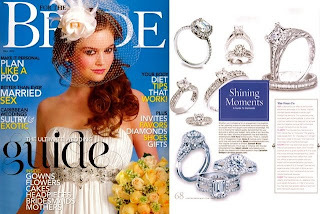 Vanna K is honored that Bride Magazine featured it's bridal jewelry when discussing the importance of the "4 C's" (Carat, Clarity, Color and The Cut) and getting a quality diamond engagement ring. This is a very important topic and in the upcoming blogs Vanna K will be providing her own helpful tips on the "4 C's. Thank you, Bride Magazine for acknowledging Vanna K as quality bridal jewelry!